What I was growing up, Friday was the day everybody could not wait for. I grew up in West Texas the home Friday Night Lights. If you’re not familiar with the storyline, every Friday night in West Texas, cities shut down so they can join their city in supporting their local high school football team. People have chants and cheers and colors set aside to celebrate their team. This weekly tradition was more than football, it was family. Though we were from different ethnic groups and socioeconomic statuses, we knew that we could unify around our team. Football was something that brought everyone together. Today as we celebrate what you describe is Good Friday in Christendom, we find out celebrating the death of Christ is a good thing. As I think about my eight week old daughter and her life that she is now living, there is nothing that would cause me to feel that her death could be a positive thing. God said it was a good thing that his son die. Jesus is the only person to have ever lived a perfect life. And because his life was without sin, he was able to stand in the place of every sinner with ever walked the face of the earth. He is the one who took our place so we would not have to pay the penalty for sin, which is death, separation from God. His death was completely necessary for us experience eternal life. he was bruised, he was embarrassed but yet he never said a word in his own defense. Jesus took it, so we can take it. So today we celebrate his courage, his calling and his commitment to seeing that each created child of God had an opportunity to have the intimate relationship that he has with the Father. So the question is, “Was it good for Jesus to die?” It did not look good, it did not feel good, it did not sound good, but it was very good. The question is what happens when our dreams die, when our hope dies, or a relationship dies ; it doesn’t feel good it doesn’t look good it doesn’t sound good but it can be very good because after the death there’s often a resurrection. 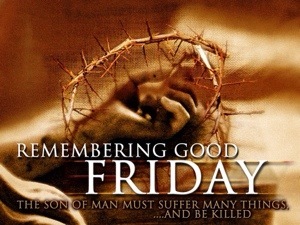 May God give you his perspective on your “Good Friday” seasons.